Ah, but Monaghan loved and lost but won our hearts. Tyrone were written off and word was that Mickey Harte had lost his magic wand. He has been through so much. His girl is happy in heaven on this Sunday evening. Dad is back yet again in the All-Ireland final. Yes, there are conflicting emotions. Monaghan gave all and lost by a bare point. They have never played in an All-Ireland final. Tyrone were exasperating at times with the old messing of yapping, running across and looking for easy frees. Monaghan have some complaints. The ref only gave three minutes of additional time. Maybe he should be put in charge of the speeches at weddings and in the Dáil chamber. But Tyrone were good enough to win. They play till the end. Do Tyrone have any chance? Yes they do. Mickey will make sure Tyrone are not afraid but Dublin are the better team. The inner sportsperson gives fair dues to Dublin who surely deserve to win four-in-a-row, yet there's a part of us that wants them to lose. It is the classic Irish confrontation between homage and begrudgery. If Dublin 2018 win the four-in-a-row, this team will pass out the Dublin side of the seventies and eighties. They will become only the third county to win four-in-a-row and, as we all know, five comes after four. The greatest Kerry team were stopped before the five. The greatest Kilkenny team also couldn't do it. Those two teams were mostly the same for their four successive titles. On Saturday, Dublin swept away Galway without the two Brogans. Cian O'Sullivan was injured early on. Michael Darragh Macauley, Paul Flynn and Kevin McManamon came on when the game was as good as over. These men are among the finest players who have ever played the game, with more than 20 All-Irelands between them. You could not possibly imagine Dublin winning a game without this elite corps or even without any one of them. Yet there is a strong possibility that not even one of the glory boys will start in the final. Dublin are more than a team. They are an age that has defied time itself. Players may come and players may go but the team goes on forever. The inner sportsperson acknowledges the majesty of their play, the scores and the Cluxton save, the organisation, the intensity, the perseverance, the eye for the kill and the skill that can't be taught but has to be learned by countless games played by small boys. The Dublin teams of yore were hardy and gutsy for sure but nearly every player on this Dublin panel is a free-range footballer. Although for me Tony Hanahoe remains the most influential Dublin player of all time. He was the one who set the standard. I don't know if Jim Gavin had Hanahoe on his mind all the time when he built up the teams of the here and now from the example of those who went before him. For Hanahoe, it was all about the collective. He is a thinker and a fighter. So too is Gavin. And for all his outer Zen, I have this sense he is seething inside with that desire to win not once but always, again and again. It's as if his Dublin always need to prove they are the greatest and Gavin will not stop until all opinion is unified like the winner of every boxing belt. Mickey Harte's team were beaten twice by Monaghan this year. Mickey too has this sense that the whole world is against his team. The successful managers usually harbour a sense of grievance, either real or imagined. His man-management strategy is all about making his players into better people. His mistake with the last Tyrone team was that he held on too long to some of his players. The Dublin management are like the bouncers at a busy night club with a queue waiting to get in. One in, one out. There is no security of tenure. But there is no team likely to beat them either, for a good few years to come. Gavin-ball aside, Dublin can hold on to the ball for longer than a coming-home-late giving-out. Dublin thrill and seldom spill. But I know of no other team that has played so many games at home in any other sport, other than Kim Jong-un's basketballers. There was an incident in and around the hour mark on Saturday, when The Hill may have served their own eviction notice. Galway were eight points down. A free for Galway from the excellent referee Barry Cassidy. The Hill whistles and boos. This is the exact opposite to Thomond Park. The Galway player is shaken. He loses concentration. The kick is as grounded as a Ryanair flight on a strike day. The Hill, or most of the Hill, cheer the wide as if was the winning goal in an All-Ireland final. This cannot be allowed to continue. Now if the home venue is all about money, well then let the GAA come on out and say as much. 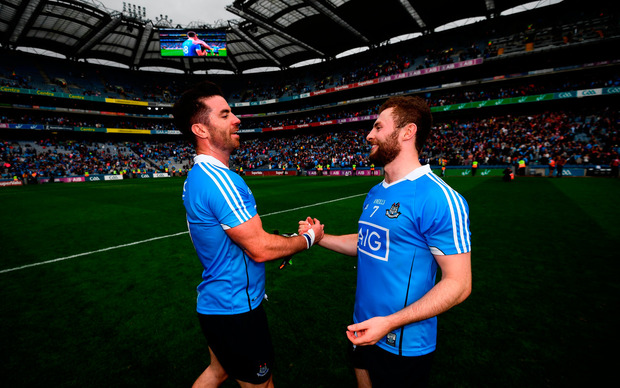 The organisation disgraced itself when Dublin, the best team in the land, the best-resourced team in the land, were given two home games in the 'Super 8s' after getting home advantages before that, with two more to come in the semi-final and final. The GAA has to decide if it is a corporate or a sporting organisation. Have the GAA a decentralisation policy? Are there vested interests who are dependent on the Dublin money? There is a battle going on for the very soul of the GAA. We must act now before the GAA has no soul left to battle for. Now an hour or so after the game, I'm trying to think of lines of some comfort for the O'Reilly family of Carrickmacross. Their mother Bernie minded me when I was a baby and she still minds me long-distance. Your boys played their hearts out. Not one of them gave up. If guts alone were to be put up on the scoreboard, the Farney would win every game. Conor McManus did all he could. I wonder could we offer him a job in Kerry? Any team would have him. The whole team bought in to the love of place. Unrequited love and love of place are constant themes in the poetry of Patrick Kavanagh. Even when his muse didn't reciprocate, he still kept on loving her. Think of a team that nearly won the girl and the glory they brought in that pursuit. Kavanagh would have kept on ploughing. The mist where Genesis begins. And to summarise - stay brave oh mighty Monaghan, you are still in next year's championship.